Orangetheory + Wild Food Café-double shot. a heart-rate monitored killer workout that will test your competitive streak. followed by a plant-based “healthified” brunch with cocktails (because its the weekend and we are not about that mocktail life). 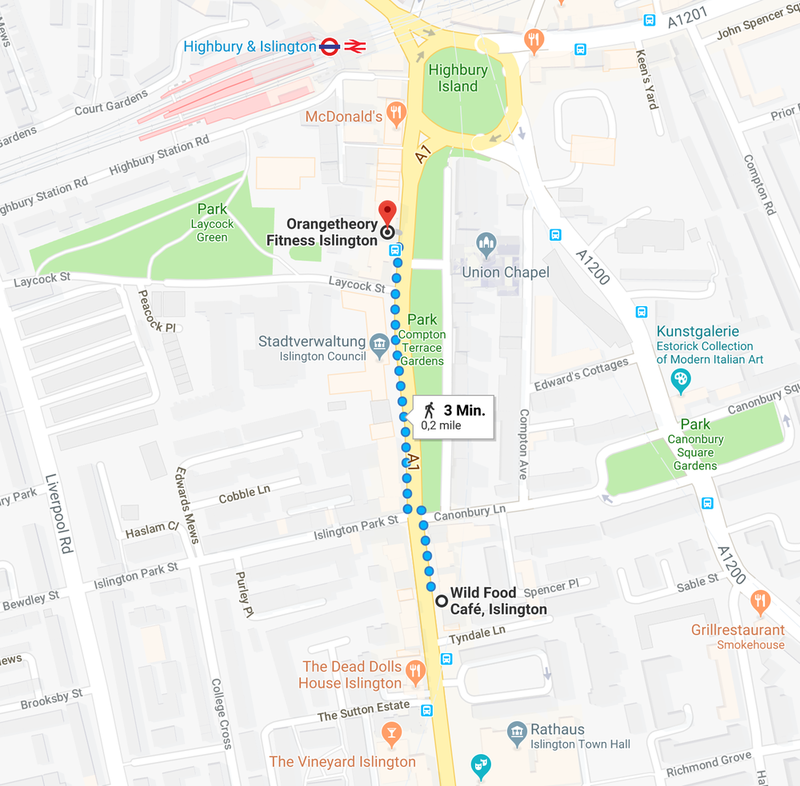 START: Orangetheory Fitness Islington, 240 Upper Street, N1 1RU, London. FINISH: Wild Food Café, Islington, 269 - 270 Upper Street, N1 2UQ, , London. THE WORKOUT: Orange 60, Saturday 10:30am with Emmanuel. If you haven’t yet tried American favourite Orangetheory and want to an intense blast of sweaty training, then freaking do it. Every day is a different full-body workout that combines running, rowing, weights and bodyweight work so you will never experience the same class twice (great if you need to be kept on your toes like us!) Heart-rate monitoring is used to track heart-rate and make sure you’re getting into the right zone for optimal class calorie burn and afterburn. But it comes down to how competitive you want to get with yourself – so you can make it as hard or as easy as you like. The even better news is the trainers here get it right with the whole motivation thing; no yelling in your face about ‘making it count’ and ‘working harder to burn those calories’, but still full of energy and encouragement to make you give your all. with date caramel is a winner for any chocoholics and the Raw Rainbow Cheesecake looks exactly like you imagine so it’s the one you’ll want to share on Insta. A superfood cocktail bar offers liquid nourishment” for the more hedonist souls; think quinoa vodka, goji berries, agave and seaweed gin. There are also plenty of juices and medicinal smoothies to wipe away those Friday night cobwebs (if the full-out sixty minute sweatathon at Orangetheory hasn’t quite done the job). THE PRICE: Your first class at Orangetheory is free. Just give the studio a call to book yourself in! After that it's £25 a class or buy a pack of ten classes for £230. Wild Food Café: Wild Green Burger £14.5, Queen of the Forest £13.5, Classic Italian pizza £13, Pepperoni pizza £15. Desserts: Raw Chocolate Tart £7.5, Matcha Moss Cheesecake £8, Raw Rainbow Cheesecake £8. Smoothies and juices from £6.5 and Superfood cocktails start at £8. BEST FOR: Living closer to the healthier edge of healthy hedonism, but still getting a cocktail out of it.